AMD is back in high-performance processors! And that's good news for video editors. At a New York event this week, AMD introduced an extension of if its impressive new AMD Ryzen processor line, extending from consumer products to the Ryzen PRO for commercial systems. What does this mean for your next video editing system? For example, AMD showed a live demonstration using Adobe Premiere Pro to transcode a 60 second H.264 clip from 4K to 720p. The transcode ran around 30 percent faster on the 16-thread Ryzen PRO 7 than on a comparable Intel Core i7 system with 8 threads (finishing in 73 seconds compared to 107 seconds). The Ryzen processors are focused on multi-threading performance, so you can be working on multiple activities at the same time, or bring all the resources to bear on a big job like encoding video in parallel. The new AMD "Zen" microarchitecture offers more processing (up to 8 parallel cores and 16 co-processing threads), and more fast data access (up to 20MB L2+L3 low latency cache). Dell, HP, and Lenovo also have announced new professional workstation systems based on Ryzen PRO chips: the Dell OptiPlex 5055, HP EliteDesk 705 G3, and Lenovo ThinkCenter M715. As a result, the competition is heating up in high-performance processors, which means that you will have exciting new choices when you start to think about upgrading to a new video system, whether a high-end workstation or a mobile notebook. 360-degree video is looking more and more interesting. You can shoot an event with just one camera, and capture the full spherical environment -- for example, a party from the center of the table, or an event from in front of the stage. Then you can share the result, and explore the full scene by looking around as the video plays, or edit it down into a traditional video in which you choose the views to show. If this sounds interesting, check out the new release of CyberLink Director Suite 6. CyberLink has a strong reputation for providing advanced produces in consumer-friendly (and consumer-priced) products. 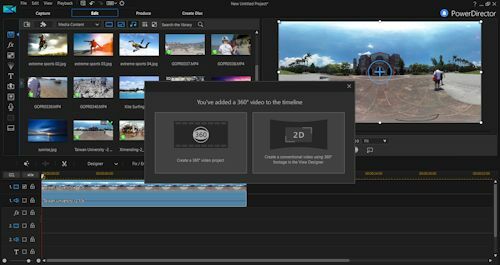 The last release of Director Suite 6 added end-to-end support for importing, editing, and exporting 360 videos (see earlier post). This release now has gone all-in with 360 video, so you can edit 360 video with basically the full capabilities of a traditional editor, with round-trip video, audio, photo, and color editing. - Use the PowerDirector 16 video editor to do traditional editing, with effects. Then add un-distorted video titles into the scene, along with images, on a motion path. Plus, it now does stabilization for 360 cameras -- particularly useful if you are shooting from an action cam. - Use the AudioDirector 8 audio editor to directly import 360 videos for audio mixing, cleaning, and enhancement. - Use the PhotoDirector 9 photo editor for 360 photo editing and adjustment, including straightening 360 photos and turning 360 photos into panoramas. - Use the ColorDirector 6 color grader to import 360 video directly to color grade, preview, and export. The new Director Suite 6 also supports "Little Planet" visualizations for videos and photos -- wrapping the 360 scene into a donut, with the option of having either the top or the bottom of the video squeezed into the center, with the scene then radiating out to the edges. This is a fun way to do a group portrait or capture a full scene to the horizon in one square image (see CyberLink video tutorial). CyberLink makes these tools available collected in suites, and individually -- and as single-purchase or for rental plans. The full Director Suite 6 with all 4 tools is $269, or $99 per year. The Ultimate Suite with the 3 video tools is $249. PowerDirector 16 & PhotoDirector 9 together are $139. with premium content packs, and the full PowerDirector 16 Ultra	is $99. and the basic PhotoDirector 9 Deluxe is $59. The other two tools, AudioDirector 8 and ColorDirector 6, are $129 each. CyberLink's new tools provide powerful technology in accessible tools for getting experience with editing 360-degree videos. These are quite reasonably priced, at around $100 each, and each is a powerful editor in its own right, even ignoring the 360 video support. For example, the new PowerDirector has added automated color matching and audio ducking, AudioDirector adds automated ambient noise generation and duration adjustment, ColorDirector adds automated tone adjustment and haze removal, and PhotoDirector adds motion stills (photos with sections in motion). See the CyberLink site for extensive product information, tutorial videos, and free 30-day trial versions of the individual tools or the full Director Suite 6 to download and try out for yourself. See earlier post for examples and links for 360-degree videos. Entries posted to Manifest Tech Blog in September 2017, listed from oldest to newest.